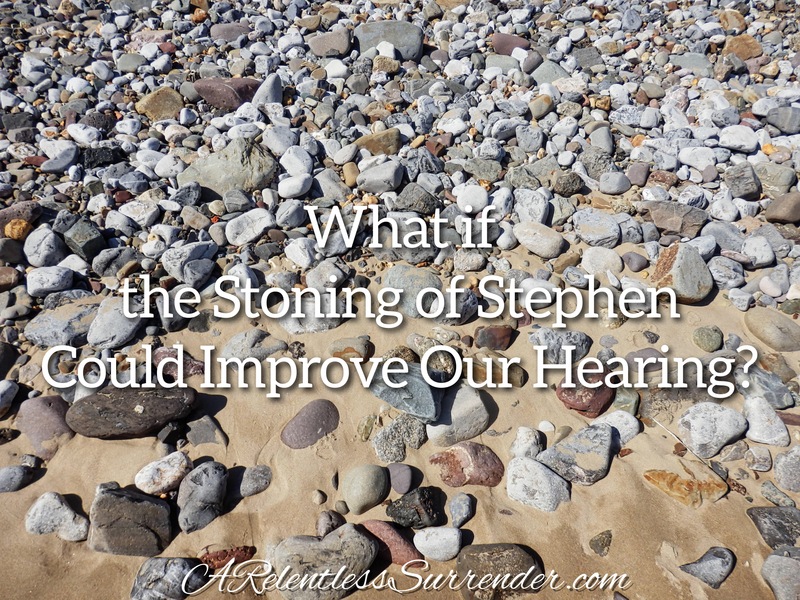 What if the Stoning of Stephen Could Improve Our Hearing? Ever been hurt, frustrated, angered by someones words or actions? I’d say we have all been “cut to the heart”, Amen? We all have a chapter in our story we wish we could rewrite. Someone was “cut to the heart”, someone “stopped their ears”, and likely, there was someone who “cried out with a loud voice”. When our hearts are wounded our ears stop working. Maybe there are some who are good at confrontation, anger management, communication… and this just doesn’t apply to them. I would say for the vast majority of us we can say at some point in our lives the hearing impairment of Stephens attackers has been our disability too. In fact, I would say we have all been on both sides at one time or another. We have stoned and we have been stoned. Ever said, “I don’t even want to hear it.”? When the story makes our hearts whence we like to turn the channel, and we’re pretty proud of ourselves too. I mean, we really did take the high road, right? There was a lot of things we would have liked to have said or done but we just physically or emotionally walked away. She said they had differing opinions on what needed doing. While she was explaining her reason he turned and walked away. I would say his ears were failing him wouldn’t you? He may have felt he took the highroad but it sure didn’t look like it to anyone else. How many relationships have been severed because someone failed to hear? Who have we stoned in our church, our family, our home, because hearts were raw and hearing dulled? Ouch! There are a few chapters I would like to rewrite. Thank you Jesus for your white out correction fluid. Amen? I have failed others most when my heart was raw and my ears were dulled. Find the source of the sound. Lay your hand on the source of the sound. Because where there are sound waves there is movement. And where there is movement there is change. What if we placed our hand on them and felt their heart; the source of the sound? We will likely need a lot less of His white out correction fluid. Amen? As I sigh and tear up reading this, I completely empathize and understand the feeling. How many times have I been so angry that I walk, or even run away because I don’t care to hear anymore, or I don’t want to hear anymore. In our struggles, as husband and wife, there have been times I have just walked away. Partly because I wasn’t being heard, but also partly because I didn’t want to hear what he said either. I have found this about myself not only in my relationship with my husband but also with my closest friends, and family. When I am trying to counsel, or advise (which I probably do too much) I find that the other party gets defensive and then eventually shuts me out because they don’t want to hear my viewpoint or truth. Thank you for your heart. Love you and yours! Thank you Susie! You are so right! Thank you for your transparency in your comment. I have missed your writing! Today’s entry was awesome! Thank you! Thank you. I have missed writing. I am hopeful and prayerful that God will continue to give me insperations. Thank you for your comment and encouragement. Thank you Bill. I hope you never quit blogging either. I always grow when I read your posts.